Dental restorations effectively restore your teeth to their normal capacity. They have been a part of restorative dentistry for decades, bringing back the smile to many people. However, no matter how sturdy they are, dental restorations can still succumb to damage, leaving you in discomfort, and feeling inconvenienced. Bondi Dental provides 24/7 dental emergency services for you and your loved ones in the Bondi community; the Eastern Suburbs; Sydney and its surrounding areas. If your dental restorations are damaged, Bondi Dental is the Bondi dentist you can trust. Every day your dental restorations participate in different functions of your teeth. Chewing, grinding, and biting are only some of these. Over time, these activities weaken your dental restorations, causing them damage. Your dental restorations have limits. Using them as tools outside your teeth’s normal functions can strain them and cause damage. Upon the initial placement of your dental restorations, your dentist will thoroughly clean your teeth and remove any flawed tooth enamel. Tips on how to maintain good oral health will also be given to ensure the longevity of your dental restorations. Neglect to follow these tips can lead to the development of secondary cavities in the affected tooth. 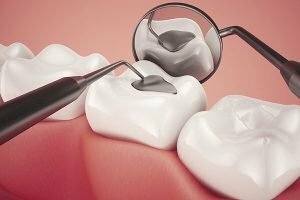 Just like before, bacteria will attack and damage your tooth until it weakens and can no longer support your dental restorations, hence their damage. Choosing the best dentist is as important as getting proper dental treatment for your teeth. Poor dental work can affect the durability of your dental restorations. Locate and secure the dental crown in a clean place. Apply clove oil on the tooth using a clean cotton swab. You can use dental cement available in your drug store or petroleum jelly to temporarily keep the crown in place on your way to the dentist. Do not use household glue. Rinse your mouth thoroughly to make sure that there are no broken dental restorations remaining. To be safe, do not attempt to reattach the damaged dental restorations to avoid accidentally breathing or swallowing them in. Swallowed dental restorations most often, simply pass. But if you breathe them in they can cause an infection in your lungs.